Atlanta Fed President Raphael Bostic is a known dove, but he took one big bold step forward. He said interest rates could go in “either direction”. So far, the Fed’s intentions were to raise rates and perhaps only be “patient” as Chair Jerome Powell said. Suggesting a rate cut is a big step forward. Another dovish FOMC member James Bullard of the Saint Louis Fed is considered the most dovish member and he said rates are “just right.” So, Bostic out-doved the most dovish member. 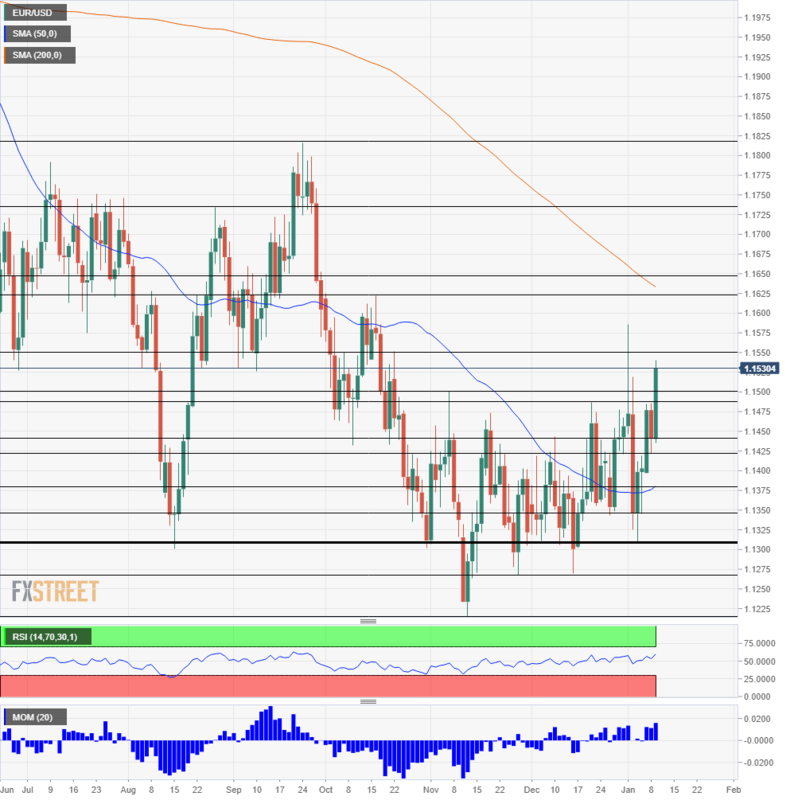 The US Dollar was quickly offered across the board, and EUR/USD finally broke out of range, reaching a high at 1.1540, the highest since October 22nd. We ignore the abnormal levels seen around Christmas when the volume was extremely thin. The first significant line of support is quite close: the October 22nd peak of 1.1550, which was a stepping stone on the way down. Next, we find 1.1625 that was a cap on October 16th and also served as support beforehand. 1.1650 is close by and provided support on September 19th. Further above, 1.1725 was a swing high in early August, and 1.1820 was a high point in mid-October. The very round 1.1200 looms overhead. Looking down, 1.1500 turns into support. It is followed by the recent peak of 1.1485, 1.1440, and 1.1425. The Relative Strength Index (RSI) is hardly above 50, allowing the pair room to run to the upside.